Writing: Each student chose an animal and wrote a riddle about the chosen animal. When finish they had time to sit at the carpet and share what they wrote with the class. Math: Math book page 258-259. Students solved word problems. Home connection: Have your child explain the solution to the problem. 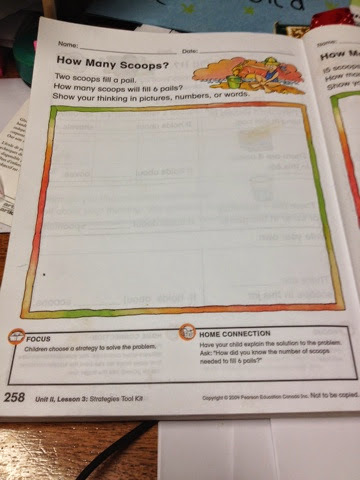 Ask:" How did you know the number of scoops needed to fill 6 pails? Science: Students did a work sheet identifying three basic material objects are made with (metal, plastic and wood). Look around your home and discuss the different materials some things are made with. Homework will be sent home tomorrow. Due to the Town Hall meeting I was not in the class to see that they had their homework folder with them. Thank you so much to all the parents and students that returned all their books on time. Masha Allah I will be giving the students a cool treat Insha Allah.